No matter what technological advances may bring, a company’s employees remain the essential component of its success. 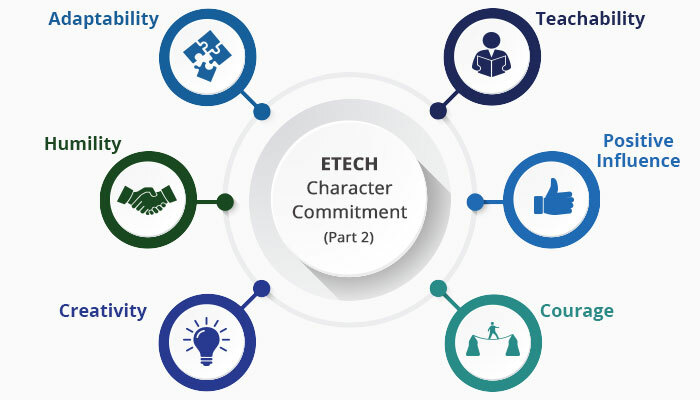 At Etech, the following character commitments promote an employee-focused servant leadership approach. When faced with new situations, company leaders often make two major types of mistakes. While some steadfastly refuse to accommodate any changes, others get carried away and completely throw out older approaches. Neither of these actions is likely to lead to success. Adaptability, which is the art of integrating innovation with established processes, helps companies stay current even as circumstances fluctuate. As today’s technology continues to grow by leaps and bounds, you need an adaptable team that can rise to the challenge and integrates tech solutions with creativity and adaptability. Humility does not mean underestimating yourself. Rather, this characteristic showcases a sense of proportion and the understanding that one can always be better and learn more. Whether you are an entry-level employee or the CEO, practicing humility is essential to achieving the full range of your potential. It encourages openness to new approaches and a willingness to listen to others, which in turn build loyalty within the company. It also means seeking out good resources when necessary, rather than trying to do everything on one’s own. Thinking outside the box remains a vital ingredient of successful customer service. Encouraging creativity in solving problems within the scope of a particular function empowers employees to think of themselves as part of the big picture. This approach also promotes real solutions that increase customer satisfaction, as opposed to rote responses that only serve to check off a box. Learning and adapting is the key to future improvement. Employees at all levels benefit from teachability, as they learn new skills to improve their performance. AI data gathering and pattern analysis can identify areas where particular changes may need to be made; based on this information, managers can change instructions for customer interactions and upgrade employee training. This aspect of servant leadership is often neglected, as it can be hard to define. However, making a concerted effort to promote positive influence as a character commitment can go a long way towards creating a productive, motivated environment. Leading by example and developing individual relationships with employees can help establish an environment of encouragement and positivity. Courage as a character commitment can take a variety of forms. It can mean taking an extra step to implement a creative solution. It can mean being open to new technology and its integration with your existing workplace. It can mean choosing to take the long, hard way rather than the shortcut. In terms of servant leadership, it can take courage to do the right thing rather than the easy thing. This characteristic is often necessary to put into action all the other Etech commitments such as humility, creativity, and adaptability. Developing a clear, thoughtful approach to implementing servant leadership in the workplace can help you build a strong, motivated workforce. AI resources can be of immense help in providing the data analysis you need to develop specific ways to integrate these Etech character commitments in a particular setting. However, no AI can make these character commitments; investing in your employees’ development is the only way to achieve that.